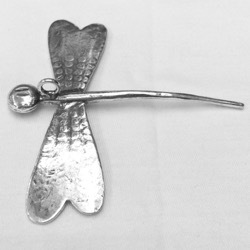 This pendant may be used both individually or in assemblage with other components listed under Turkish Silver Supplies. Its large size will make it one of the most eye catching pieces of your collection. 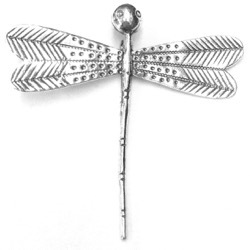 The bottom hook can accomodate most chain sizes, for more flexibility a separate pendant hanger is listed under Silver Supplies / Connectors category. Contrast enhanced with dark paint on the crevices, patterns occur on one side of the wings. Depending on the stock, the body length may vary between 70 mm and 80 mm, wings are always 80 mm.